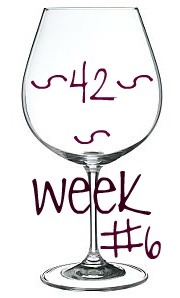 Catching my Breath: Wineglass Training Week 6: over half way! I'll be pretty honest and say this week my legs felt blah, but my excitement for the weekend kept me going. Turned out to be a solid week, which leaves me feeling good heading into the final month of training for Wineglass. I had a pretty big week last week (for me) and that left me pretty tired this week. I struggled with motivation to get out there because my body just didn't feel fresh. BUT, I still got most of my miles in for the week (dropped Thursday's run to give myself a little rest for the weekend and the race). Looking back I am glad I backed off a little, and didn't run on Thursday- it was a smart move and I will be a good blogger and pat myself on the back for that. This weekend has been an absolute blast, vacation with Hollie and Heather was just what the doctor ordered for my attitude. 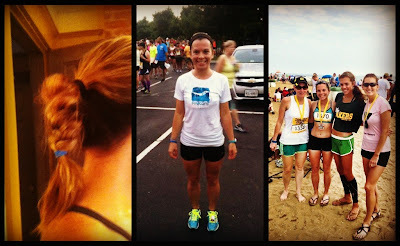 Okay so warm weather, the ocean, and a race obviously helps as well... I mean lets be real here. Today we ran the Rock N' Roll Virginia Beach half- marathon, if you follow me on twitter, instagram or are friends with me on Facebook you already know I had a pretty damn good race- but I will post more about that at another time. After the race the 3 of us also met up on the beach with Kristy, which was awesome to finally meet her in person. Super pumped I get to hang out with her again when she comes to Rochester in a few weeks for the half-marathon. I really wasn't sure how the race would go because of how my legs felt all week, and I had to keep reminding myself that this race does NOT dictate how I will do in Wineglass. So if I had a crappy race, it doesn't mean I would automatically bomb the marathon; on the same spectrum, having a great race doesn't mean I will automatically have a great race at Wineglass as well. The work is far from over. The next 2 weeks will be the most important of the next 4, and I am ready for it. As for August being over, I had a really good month and it's nice to see training coming together for me. I ended the month with 186 miles, which is actually my highest mileage month all year so far. That's a pretty high month for me, not my highest but certainly above my average. I know I know, I run less miles than most would assume- but it works for me so I don't feel I need to justify that to anyone (including myself). As for what's next: this week will be some aerobic miles, followed by a 10k next weekend, and a long run that will most likely be with Laura next Sunday. I'm pretty pumped heading into the next few weeks, time to put all the pieces of the puzzle together to get me to that start line as prepared as I can be. Ever had a really crappy feeling week but finish it with a really good run/race? Usually if I had a crappy training run during the week before a race, that's a good sign that I'll have a pretty great race. The crappy runs happen I guess, sometimes the good races "just happen" too though. You had an amazing race at RNR, just read your update on Daily Mile about it, congrats on placing so high in your age group too. I know it doesn't dictate how well you'll do at Wineglass but there's nothing like a strong performance in a race to keep you going in a training cycle- and it's hard when there aren't many races during the summer because your training run after training run routine can really put you in a rut (me anyway). I'm glad you had such a great weekend/race! I had a semi crappy week in workouts but today is the start of a new week and I'm moving forward. I'm so proud of you and your race this weekend. You seriously did awesome and after the day before training run. Like I said to you earlier, I cannot believe wineglass is getting so close and I know you are going to do awesome. I also know this 10k is going to be fantastic next weekend! That's great that all went so well! I can't wait to hear about the race! I can't wait to hear how your race went! but nice job on that monthly mileage. I can't believe wineglass is coming up so fast? I feel like i've been training forever and still have 3ish weeks to go. Looking forward to our long run Sunday! My week was relatively good! Nothing too exciting but the humidity definitely put a damper on my mood sometimes. I am just not a fan of barely being able to breathe and sweating as soon as I step outside. Lol! YAY for having a great race weekend with the layyydayyys! I was pretty pumped to see you did well on Facebook! Awesome week of training/racing that you just had, Wineglass better watch out! Great meeting you in person, see you in a few weeks! Can't wait to hear more about your weekend! And of course I can't wait to read the race recap!!! Great job as always with your training girl!!! I'm so glad the race went well! I completely forgot that you were going out for the race...too bad it was when I was in Rochester! A great end to a crappy running week makes it all worth it, to me.